The Ethical Tea Partnership is an initiative of the tea industry world-wide. The ETP aims to achieve a “thriving tea industry that is socially just and environmentally sustainable”. The ETP works in conjunction with Care International to improve the living conditions for tea plantation workers in Sri Lanka. In areas where tea plantations border on wildlife habitats, the ETP works with the Nature Conservation Foundation to preserve native wildlife and the environment. The ETP-NCF partnership also works to put in place measures to protect plantation workers from encroaching wild animals. The Taprobane Tea Company supports the programs of the Ethical Tea Partnership and we are in the process of applying for membership. The first tea was planted in 1867 by the Scotsman, James Taylor, on Loolecondera Estate in the central highlands of Kandy. By 1899 tea plantations had expanded to around 160,000 hectares with an accompanying need for an extensive labour force. Given the relatively small indigenous Sinhalese population (around 2.5 million in 1871) at the time and their general reluctance to work on plantations of either coffee or tea, Tamils from India were brought to Sri Lanka to provide the requisite labour. In 1855 around 55,000 Tamils migrated from India to Sri Lanka to work on plantations of first, coffee and later, tea. The number of Tamil immigrants grew to 100,000 by the late 1880s. The descendants of these same Tamil immigrants are still employed as plantation workers in the tea industry today. At present the tea industry provides employment for over one million Sri Lankans, either directly or indirectly. There are vast cultural differences between Tamils and the indigenous Sinhalese people. The descendants of Tamil migrants have Tamil as their first language and are Hindu. Sinhalese people, speak Sinhala, a very different language from Tamil, and are Buddhist. Generally speaking, in the colonial era, Tamils migrants were not welcomed by the Sinhalese and historically there have been ethnic tensions between these two cultures which have survived into the present era. Living conditions of plantation workers are generally poor when compared with conditions else where in Sri Lanka. The vast majority live on site in “line houses”, a system of linearly attached dwellings with just one or two rooms per family. Typically, there are 6, 12 or 24 line rooms in a one-line barracks. Usually there are no windows and no indoor sanitation and 6 -11 family members may live in a single room. The wages of tea plantation workers are some of the lowest in the country at just $2.50 to $5.00 per day. 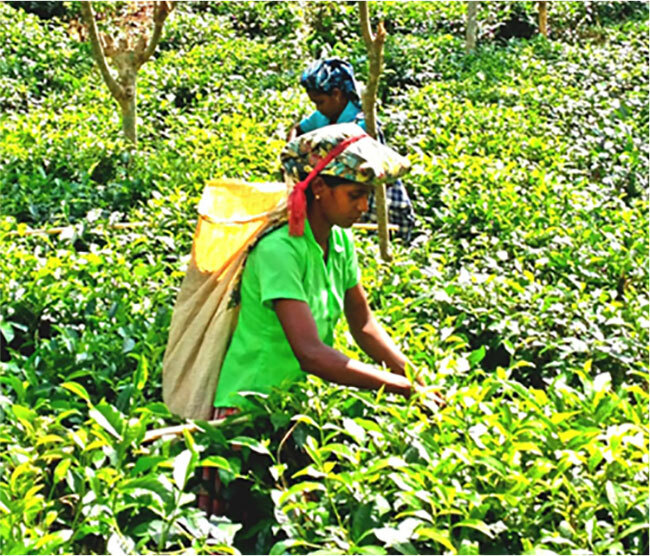 Around 85% of tea plantation employees are women. Traditionally, the women pluck the tea whilst men are employed in cultivation and production of tea in the factory. Women generally work longer hours than men but receive lower wages. Children as young as twelve are employed as plantation workers. The Ethical Tea Partnership is working to improve living and employment conditions for plantations workers. The ETP, in conjunction with Care International and funded by the EU, has established Community Development Forums on several tea estates in Sri Lanka. Some of the most important aims of the Forums are to promote equal opportunities, improved productivity, increased incomes, access to community savings schemes, improved medical facilities and better relationships between Sinhalese and Tamil ethnic groups. Particularly pleasing are the ETPs efforts to provide gender equality training and equal opportunities for women. In the 19th century more than 100,000 hectares of pristine rainforest were cleared in Sri Lanka to establish coffee plantations. Eventually, tea supplanted coffee on the island and further rainforest was cleared to extend the area of the tea plantations to more than 200,000 hectares. In establishing coffee and tea plantations, Sri Lanka lost vast areas of native flora and fauna. The affect of loss of significant habitat for such native animals as leopard and elephant can only be guessed at. Ironically, trained elephants were used to perform much of the heavy work involved in clearing their own habitat! Written records and photographs from the colonial era clearly indicate that elephants and leopards were systematically eradicated from tea and coffee plantations and were, tragically, also hunted for sport. In present times, many tea estates in Sri Lanka are bordered by rainforest, particularly in the central highlands. Wild elephants from the rainforest sometimes enter tea estates and cause damage to the plantation and infrastructure. They may also consume food crops and injure plantation workers. Retaliatory attacks have been known to harm or even kill elephants. In Sri Lanka the Ethical Tea Partnership has been working in conjunction with the Nature Conservation Foundation (NCF) to protect both workers and elephants. Some of the initiatives include the installation of early-warning trip wire systems, safe methods of dealing with dangerous confrontations and changing patterns of food storage so that buildings are less likely to be damaged. Other methods of preserving and enhancing elephant populations include keeping migratory routes unfenced and leaving wild life corridors in place. It is also suggested that elephants be allowed to roam freely through estates and that some areas of natural vegetation be provided for foraging. All of this is good news for both people and pachyderms!